You will be given a reference e-book to read which has 702 pages And the test will be based on that e-book , you can take final test within 1 year of purchase. Signal reconstruction and acquisition which refers to the process of measuring and storing physical signal and then rebuilding it or its approximation in the future. If you try to process signals of digital systems, then this goal is characterized by quantization and sampling. If you have longed to master the signal processing process, then it is advisable for you to take part in the signal processing certification program which you can now easily access at Brainmeasures. 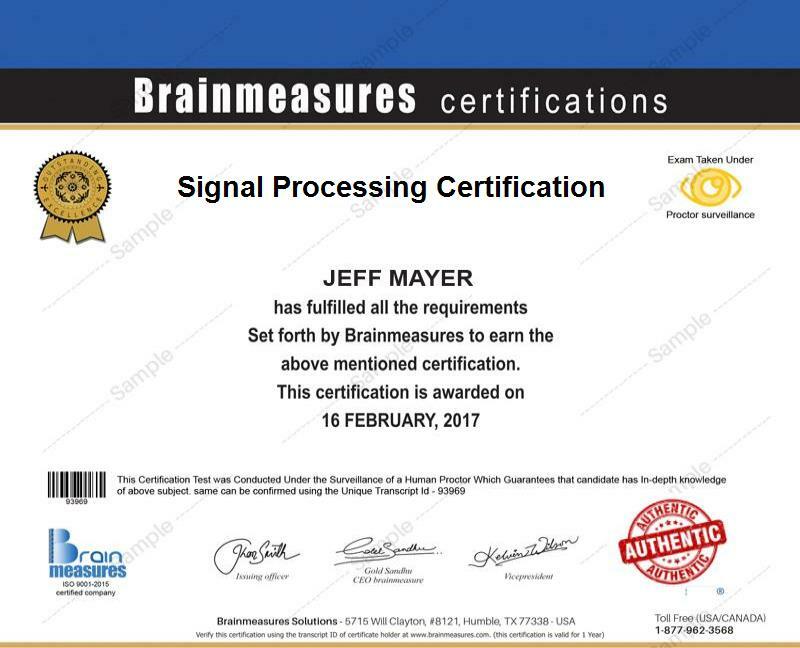 As a highly reputable online certification company, Brainmeasures can be expected to work effectively in providing you the most relevant and accurate signal processing information after you decided to enroll in its signal processing course. By enrolling in this certification course, you will be able to allow yourself to undergo a signal processing training which covers the most vital concepts associated to the process, the theories and principles that continue to drive the process, the major objectives that signal processing wishes to accomplish, the different fields and categories that it encompasses and the many methods that it utilizes in its operations. The signal processing certificate that you will receive from Brainmeasures is effective in showcasing your skills and expertise in this specific field. How to carry out the digital filter designing process? The signal processing certification program offered by Brainmeasures is established in such a way that it helps numerous individuals and professionals acquire the signal processing information that they need. It targets geophysicist, engineers, audio, video and imaging analysts, program managers and any other professionals who wish to gather information about the theories associated to signal processing so they will be able to easily implement even the most complex process and method associated to it. A higher level of salary can also be expected to be provided to signal processing certification holders. If you already hold your signal processing certification, then you can start using it to get the position of a signal processing developer which offers you an annual salary within the range of $64,000 to $76,000. You can also use your certification to work as a signal processing engineer which offers a profitable pay of around $90,000 to $141,000 annually.